Heavy Industrial Motors section on Export Portal offers a variety of machines produced by the largest manufacturers. 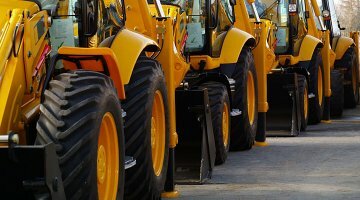 Heavy-duty vehicles are designed for executing construction tasks, most frequently ones involving earthwork operations. These machines are necessary for all the building, mining, and digging works, as well as in agriculture and chemical industries. Heavy machines usually comprise five equipment systems: implement, traction, structure, power train, control, and information. Heavy trucks function through the mechanical advantage of a simple machine, the ratio between input force applied and force exerted is multiplied. Some types of engineering equipment use hydraulic drives as a primary source of motion. Standard heavy vehicles categorization includes a diversity of types and models, among which are tractors, excavators, skid steers, combines, dozers, cranes, lifts, cutters. To buy heavy industrial motor, it is important to consider the following: some contractors place numbers on the side of their equipment corresponding to the category - Grader '02' - followed by a sequential number that usually corresponds to the number it was purchased, for example, 02-112, is the 112th grader a company has purchased since their founding. This allows for easy recognition of the equipment type and the relevant age. Heavy equipment requires specialized tires for various construction applications. While many types of equipment have continuous tracks applicable to more severe service requirements, tires are used where greater speed or mobility is required. An understanding of what construction equipment will be used for during the life of the tires is required for proper selection. Tire selection can have a significant impact on production and unit cost. There are three types of off-the-road tires, transport for earthmoving machines, work for slow-moving earth moving machines, and load and carry for transporting as well as digging. Off-highway tires have six categories of service C - compactor, E - earthmover, G - grader, L - loader, LS - log-skidder and ML - mining machines and logging machines. Within these service categories are various tread types designed for use on hard-packed surface, soft surface and rock. Tires are a large expense on any construction project. That's why when you purchase heavy machines, give a careful consideration to prevent excessive wear or damage. Due to the small profit margins on construction projects, it is important to maintain accurate records concerning equipment utilization, repairs, and maintenance. The two main categories of equipment costs are ownership cost and operating cost. It is good to take into account these costs if you have industrial machines for sale, or want to find a good heavy truck. Heavy hydraulics also include flushers, delimbers, drill rigs, electric trucks, grinders, harvesters. If you want to buy or sell heavy industrial motors, choose Export Portal for the best deals!